My today's lunch menu was simple and delicious. Tomato soup and bread. 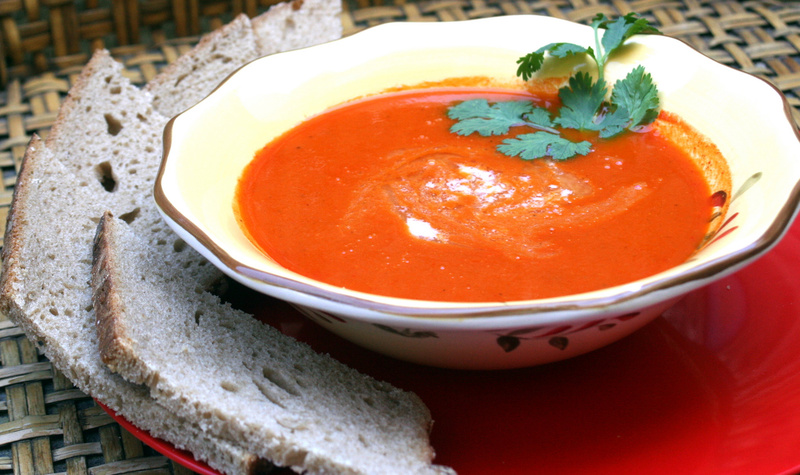 A can of diced tomato, an onion and few spices can be turned into one delectable delight - 'tomato soup' that is simple, homemade and fresh. Most of the tomato soup recipes are similar. The spices/herbs we add to it makes all the difference. This recipe with Indian spices and herbs, is so simple and easy to prepare. Here's the recipe. Chop the onions and dice the tomatoes. Heat a teaspoon of butter in a kadai and add the bay leaves, garlic and chopped onions. When the onions turn light brown, add the tomatoes and pour water. Cook covered for 15 minutes or pressure cook for 2 whistles. When it cools down, fish out the bay leaves and grind the content. Allow the ground content to boil in low heat. Add the turmeric, asafoetida, red chilli, dhania and cumin powders, crushed peppercorn and salt. Mix well. You can omit red chilli powder if you do not wish to have a spicy soup. Allow it to boil for another 5 minutes in low heat. Stir occasionally. The soup is ready. Enjoy the soup garnished with a dash of butter and 2 sprigs of cilantro. If the tomato is too sour, adding cooked carrot pulp (cooked and mashed carrots) will beat the sourness in the the soup and will enhance the flavor as well. 1. If you do not want the tomato seeds or the peels in the soup, strain the ground content and allow it to boil. If you use peeled diced tomato can, this procedure won't be necessary. 2. If you use the peeled diced tomato can, you can add a handful of split moong dal or masoor dal before cooking the tomato. In that case, add a little more water. This will boost the protein and also will make the soup filling. 3. If you are following the straining method, you can add a cup of cooked split moong dal or masoor dal for a protein boost after the tomato is ground and strained. 4. Blanch the tomatoes first and then use it. This way, you don't have to strain the pulp. 5. Soup with bread, croutons and/or soup sticks make it more appetizing. Hi, I was looking for soup recipes. This is a good one. Just posted red pumpkin and chickpeas soup on my blog. Do have a look. Ya, it is healthy and very appealing too. Thanks!